*Murder! *the letter says, *Come at once. Anson House, Greyminster, Staircase No. 3. *How can Flavia de Luce resist such an urgent plea? After all, examining a dead body sounds like a perfectly splendid way to spend a Sunday. So Flavia hops upon her trusted bicycle, Gladys, whose rubber tires hiss happily along the rainy road, and arrives at her father’s mist-shrouded old school. There, a terrified boy leads her to the loo where, sitting in a bathtub, is what appears to be a statue. 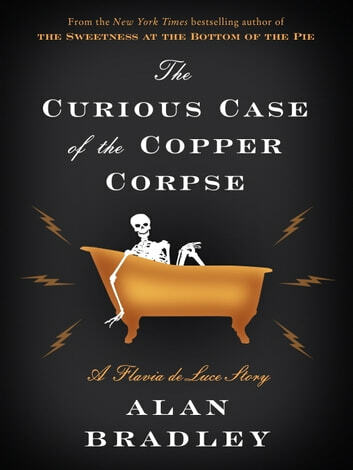 But, no: To Flavia’s surprise, the thing is in fact a naked dead man. Save his face, he seems to have been carved out of copper. Never one to shy away from the macabre, Flavia gets to work—only to find that when an investigation begins with a metallic cadaver, ever more curious twists are to be expected. I'll read any Flavia story Mr. Bradley cares to write. But she's not her best in the short story form. A neat and tidy story. Very Flavia. Would have liked it to be a bit longer for the price of $2, still recommended though. very enjoyable read, but too short. 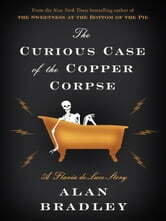 This story from Alan Bradley is great in continuing Flava De Luce it was a good story but dispointing in the lenght I would have enjoyed a full book but it was interesting. If you like sleuth type stories well enjoy this one. I get it. It's a short story, but Flavia needs more to really shine in her murder mysteries. It simply went too fast. I love all things Flavia. After reading "The Sweetness at the Bottom of the Pie" years ago I was instantly hooked on the series and have been dedicated to it since. I prepared myself for the this to be an abbreviated version and so wasn't terribly disappointed. It has all the classic notes which make Flavia endearing so in that way it was enjoyable. The beauty of the novels is in the way we get to enjoy Flavia's process in her investigations while weaving the stories of her and her family and friends alongside into a complete narrative, so in that way this short story was lacking. I can't get enough her cheeky and loveable personality so I couldn't help wishing I was reading another Flavia novel. All in all- fun, light and quick but don't set the bar too high for a Flavia story or it'll probably far short for you.